This October the Banff Mountain Film Festival will be held in the magnificent Rocky Mountains of Alberta, Canada. It is an annual event that is rapidly becoming a must-attend event on the global film festival calendar. It showcases films and documentaries that have a particular emphasis on mountain culture, the environment, and sports. Every year since 1976, the Banff Mountain Film Festival allows filmmakers from all over the world to interact with each other in an exciting creative environment. This event also provides an opportunity to enjoy outdoor activities and mingle with mountaineers, climbers, gear manufacturers, and journalists. 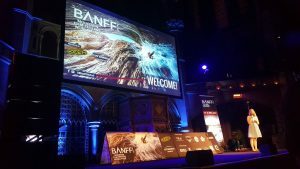 One of the most distinct and exciting parts of this event is the Banff Mountain Film Festival World Tour. Once the festival concludes in November, selected films go on tour all across the globe. Each tour location has a host organization that chooses a program based on the interests of the local community. Every year, the Banff Mountain Film Festival World Tour visits about 305 cities in 40 countries and has about 550,000 tour attendees and 1,100 film screenings. The Banff Mountain Film Festival is a member of the International Alliance for Mountain Film (IAMF), an organization that produces, promotes, and conserves mountain-themed films. This year’s festival promises nine epic days of fun-filled activities and events. The 2018 lineup and schedule of films will be announced this August. Tickets will be available in the same month. Independent and aspiring filmmakers and finalists also have the chance to join the Banff Adventure Filmmakers Workshop. This seminar will give them the chance to work with other filmmakers to improve their skills under the expert guidance of a world-renowned adventure filmmaker. The selected films from this year’s competition will have the opportunity to be presented during the World Tour and be screened in over 550 locations worldwide. The Banff Mountain Film Festival started in 1976. Originally, it was launched as The Banff Festival of Mountain Films. The festival was founded by The Banff Centre, an institution in the Canadian Rocky Mountains. The Banff Centre started life in 1933 as a school with a single course in drama. Over the years, it grew to into an institution that had a keen focus on the arts. Thanks to the help of public grants and funding, the Banff Centre became a leader in the improvement and promotion of innovative work in the arts, sciences, and the environment. The Banff Mountain Film Festival presents the following awards to the competition winners. For all the other awards, the festival gives $2,000 CAD to the selected winners of each category. Best Short Mountain Film – Any film submitted into any festival category with a length of 15 minutes or less will automatically be eligible for the Best Short Mountain Film Award. 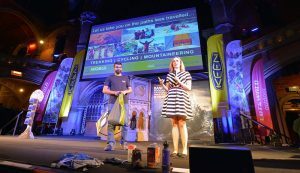 Best Feature-length Mountain Film- Any film submitted in competition for any festival category with a length of 70 minutes or more will automatically be eligible for the Best Feature-length Mountain Film Award. Award for Creative Excellence- This award will be given to a film entered into any festival category that exhibits creativity and innovation with a touch of a spirit of adventure. A jury selects the winner for this category. People’s Choice Award- The winner of this award is chosen by the audience all over the world through the Festival’s voting system. A film can only be submitted into one category. The Banff Mountain Film Competition has final decision on which category every film entered to the festival. While films can only be submitted into one category, entries are not limited to just one award. A pre-selection committee headed by the Festival Director and Programming Director will screen all entries before the festival starts. The pre-selection committee chooses finalists from the entries received. These entries will be screened by an international jury and shown to the public at the Banff Centre Mountain Film Festival. The awarding ceremony takes place on the final day of the festival where the winners will receive their awards. Here are last year’s winners from each category. The Banff Mountain Film Festival has gained the support of several organizations including the Mountain Equipment Co-op (MEC), Smartwool, The North Face, etc. These organizations sponsor the awards at the Festival. The call for film submissions for the 2018 Banff Mountain Film Festival is still open! But hurry because the deadline for submission of entries is August 1, 2018. Filmmakers can submit their films to the festival through FilmFreeway. Entries should be in a .mov or .mp4 format, with image size 960×540, target data rate of 4Mbps, and audio codec of AAC at about 160 Kbps. For a complete list of technical requirements, rules and regulations and information about film submissions, visit the Festival’s official website at https://www.banffcentre.ca/banff-mountain-film-book-festival. The 2018 Banff Mountain Film Festival will run from October 27, 2018, until November 4, 2018.